One of the major immigration trends of the past decade has been the emergence of the figure of the Digital Nomad. Equipped with just a laptop and a passport, these workers represent the office-less workplace of the future. For these ‘citizens of the world’, from a treehouse in the Amazon to a café on the Tiber. Thanks to the growing phenomenon of remote-based work the world is their office. If you are planning to embrace life as a digital nomad, you will need to identify locations that meet your needs both as a worker and as a traveller. While a worker needs access to good technology and quiet spaces, travellers require excitement – so how can you find a location that seamlessly blends the two? So, what makes a city great for digital nomad workers? For many a low cost of living is the most important factor. Another key consideration is fast and reliable WiFi availability as you will be depending on this to earn money. It is also useful to have access to co-working spaces which will allow you to do your job in a quiet, work-friendly environment. The digital nomad life can be a lonely one so for many it’s also very important to have access to a nomad community to provide a social aspect. Now we must ask, what makes a city great for digital nomad adventurers? Beautiful, sunny weather is of course a major factor. Cities with a rich food culture also offer an appealing prospect. Night hawks may favour destinations with a vibrant nightlife. The best cities blend together aspects that appeal to both the worker and the adventurer in you. Of course, it is important for you to choose a city that’s right for you and caters to your specific needs and interests. 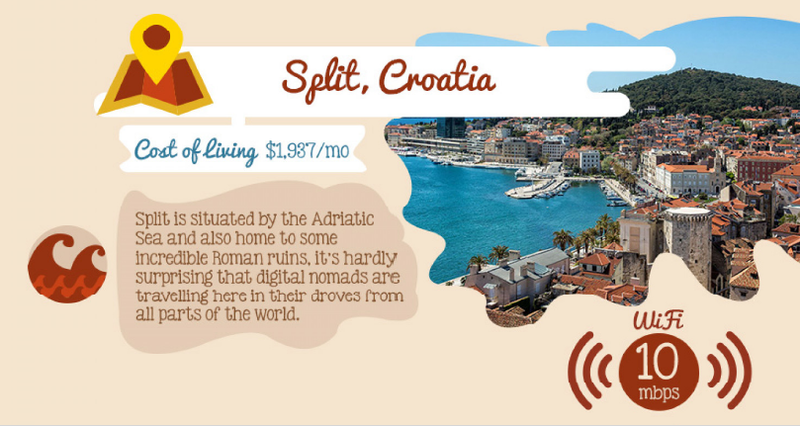 If you would like a head-start on planning your next move, we recommend consulting this handy infographic from Hansen & Company entitled “The Best Places to Live as A Digital Nomad.” A highly useful resource, this nifty graphic breaks down the top digital nomad destinations and looks at what makes them special. Featuring a number of wonderful cities from across the continents; this infographic offers a truly global take on digital nomadism. For those keen to relocate to or within Europe, this infographic includes information about the hottest European digital nomad destinations. It outlines in detail the advantages of the somewhat undiscovered gems of Lisbon in Portugal, Budapest in Hungary and Split in Croatia. Each option offers something wholly unique to today’s digital nomads. Thanks to Hansen & Company for this infographic and guest blog post.